Recently every day it is a bit of a struggle with what to wear to work. Some days I’m bloated and most of my pants don’t fit and others I feel pretty good and want to dress that way. However as the weeks tick on, I am finding myself struggling to find a balance between things that are now too small and things that do not quite fit me yet. At 14 weeks I am still in that in-between stage where instead of having a bump I look like I ate one too many burritos and tried to still fit into my skinny jeans from high school. Maternity shirts just accentuate the “burrito” at this point so they are still out of the running for a bit. Today is a rare day in that I am wearing no maternity clothes whatsoever! Say whaaaat? Yes it’s true! Boots – I have had these for over 2 years and I live in them. I believe I got them in Detroit at a store called Shoe Circus. 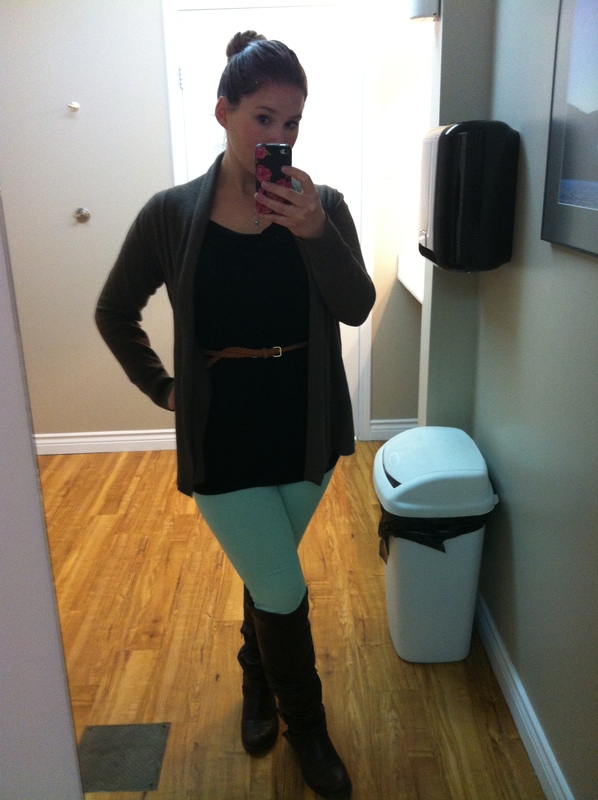 Pants – Hue Denim Leggings which are amazing and still fit awesome. Cardigan – I got this from a Frugal Fashionista event from my sister I think. Basically it is a clothes swap party that Windy used to put on all the time. Hopefully, if people find these posts helpful, I will do more!